Well not one question, but maybe a few. Placed a order today for a 76K MSRP Coupe that has to be built. Originally I was told I need to leave a $500 deposit, which ten minutes later changed into $1500. Thought $500 was the standard but it's whatever. Now, I wasn't given anything. I'm thinking that I should have at the least got a print out of the car that I just ordered. Granted he was sent a build that I made on the website, but I still think that I should be able to look over and confirm what was ordered. I dislike having to feel like a salesperson is being secretive. Fella tells me what payment is going to be and I'm like okay. All is this done via email. Sent over a very detailed question about residuals, MF, cap cost and so forth and was given a half answer. In fact, I answered my own question and just asked him to confirm my numbers. At this point, what if any car documentation should I have? He already ran my card and said order was placed. Thanks in advance and I look forward to being a active member. Last edited by rcsjr; 05-16-2016 at 11:07 PM. It's usually $1K and refundable. Make sure it is. I ordered mine and put a $1k deposit over the phone using my cc. I received a build sheet a few days later and then nothing until I went into dealership to sign paperwork. Lease as well. I have a history with this dealership, so no concerns on my part about the deposit. 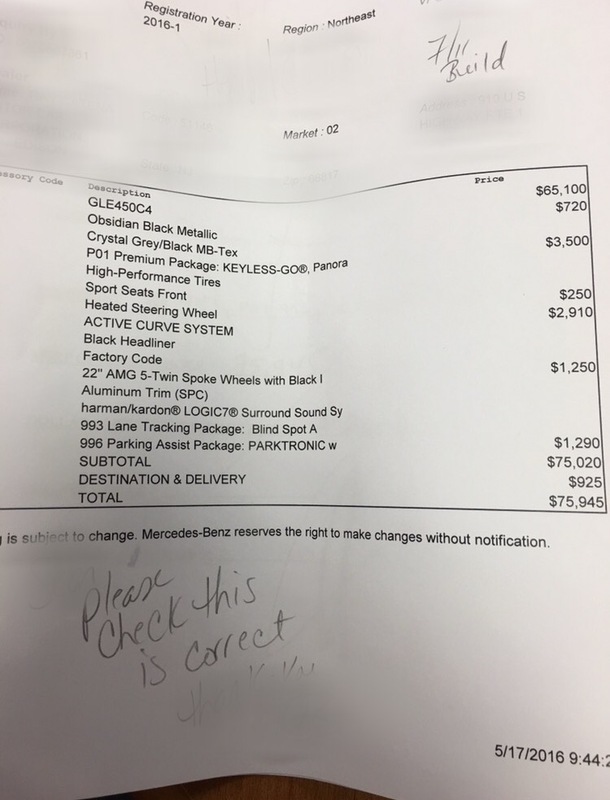 When I ordered my GLE 350 in February, I received a receipt for my deposit, a copy of the exact build sheet and a copy of the dealership order form. Thanks for the responses. I'll physically be in the dealership tomorrow so I'll ask in person all the things that I think haven't been provided. I'm in sales as well and my approach is to always be clear and upfront with people so I don't enjoy having the feeling like someone isn't being transparent with me. 1st and foremost, if your card was already charged, they should be able to provide you with a receipt. Next order of business is if they indeed did have an allocation apot available and placed your order already, they should be able to print you something showing exactly what was ordered with the option codes etc. If they can't, or won't, I'd be inclined to question if the order was indeed placed, or are they waiting for an open slot. I put a 1K down on my 2016 GLE 350 and received a signed copy of the order build sheet. Salesman kept me informed of the status to once he got a build date from the factory. I waited just over two months for mine. Last edited by mkspear32; 06-09-2016 at 01:26 PM. 1) The order was for a 2017 - correct ? The GLE coupe isn't an easy sell; it's expensive and the market for a SUV coupe is relatively small. For a low volume dealer, ordering one (especially if your spec is a bit 'odd') is a real risk. Here it is. It's a hard sell but they continue to beat home that this car is super hot. I want the car but don't really want it. I've never waited more than two weeks for a car. My sales rep. also works within the company I work for so I only went with him simply because he posted on the company bulletin board about being able to get fleet discount on any MB vehicle. Took him up on it and so far things have been inconsistent. I was charged $1500 for a deposit on a ordered car when most people here seem to get charged $500 or $1000. I also noticed that they're charging me $1095 Acquisition fee but I called MBFS and they said the fee is $795. BS fee still but why the mark up? Also a 499 deal doc fee. So I'm here thinking whether or not he regards me as a colleague or a enemy. I more than likely will cancel my order just for that reason. I could have walked into any local dealers and negotiated a better deal on my own. Have special ordered several cars from my dealer. All that was involved from a $$ standpoint was a handshake. It's what the dealer wants to do.